The Keysight E4405B is available to buy refurbished used or rent, usually from our UK stock. Click here to download the Keysight E4405B datasheet. The Agilent E4405B is a member of the Agilent ESA-E series general purpose, portable spectrum analyzers, which offer a wide range of performance, features and flexibility previously unavailable in this price range. Five models offer frequency ranges starting at 9KHz and ending between 1.5GHz and 26.5 GHz. The 1 ms RF sweep time and up to 40 measurements per second gives you virtual real-time measurement response. This means you spend less time testing or tuning circuits. High-speed remote measurements and data transfer of up to 40 measurements per second reduce critical test time in automatic test environments. Optional 50ns zero-span sweep time illuminates fast changing signals in the time domain. A continuously phase-locked synthesizer operating over the entire sweep provides improved frequency accuracy, stability and repeatability. The outstanding amplitude accuracy of +/- 1dB up to 3 GHz and +/- 2.5dB up to 26.5 GHz adds measurement confidence, improved yield and reduced test margins. The amplitude correction factor capability lets users remove frequency-related effects. Automatic background alignment provides continuous calibration between sweeps, which means the full accuracy is maintained without operator intervention. With the optional digital resolution bandwidth (RBW) filters (10Hz to 30 Hz), you obtain finer resolving power to separate and measure closely spaced signals. A narrow shape factor (5:1) aids measurement of small signals close to the carrier. These digital RBW filters sweep up to 220 times faster than their analog equivalents, while improving sensitivity. 99 dB maximum 3rd order dynamic range (+12dBm TOI) and the 5 dB step attenuator let you see low-level distortion. Spur searching is enhanced with the -152 dBm sensitivity, optional built-in preamp and the fast measurement speed. Up to 120dB of calibrated display range allows simultaneous display of large and small signals. Take the analyzers lab grade performance into the field protected by rubber encased frames, rain-resistant front panel and shielded vents. A snap on battery provides up to 1.9 hours of cordless operation and 12V dc capability allows operation with automotive electrical systems. Five-minute warm-up offers full measurement accuracy without waiting. And, automatic back ground alignment maintains the full measurement accuracy over time and varying temperatures. The ESA-E series can be configured specifically for your application as well as protect your investment into the future. The six-slot option card cage allows you to choose only the performance you need now and upgrade in the future. This scalable performance in combination with Agilent measurement personalities, downloaded into the internal memory, can transform the analyzer into an application focused solution, for example, CDMAOne or GSM measurements. A growing number of plug-in option boards provide even more measurement capability. Most option boards are easily installed into the built-in card cage and are retrofittable. 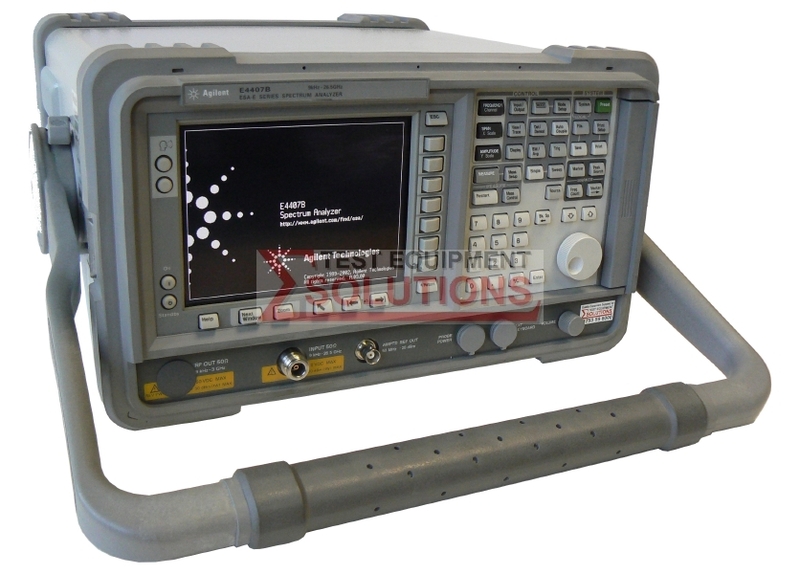 We offer the refurbished used Keysight (Agilent) E4405B 13.2GHz Spectrum Analyser for sale and rental. The Keysight E4405B is fully tested and refurbished in our in-house ISO9001 calibration laboratory. We supply manuals, accessories, full warranty and a free-of-charge Certificate of Conformity. We can also provide the Keysight E4405B with a fresh calibration for a small additional charge. If you have under-utilised test equipment talk to us about trading-in or part-exchanging it towards the Keysight E4405B or other refurbished test equipment.